Technology stocks have a tendency to be associated with growth stocks. High-flying tech stocks like Amazon (AMZN) or Netflix (NFLX) typically have lofty valuations, inconsistent profitability, and rarely pay dividends. As a result, the high-growth tech industry usually has little to offer value and dividend investors. But investors looking for reasonable valuations and dividend income do not have to avoid the tech industry altogether. There are a few high-quality tech stocks that have strong profits, modest valuations, and pay dividends to shareholders. For example, Intel Corporation (INTC) is a classic value and income stock. It has a cheap valuation and a solid dividend yield of 2.4%. And, like many of its tech peers, the company has a long runway of growth ahead. Intel is the world’s largest semiconductor company. It has a market capitalization of $240 billion. It is a chip manufacturer, with a heavy presence in personal computers. This has held Intel down in recent years, as the PC industry has stagnated as consumers shift toward mobile devices like smartphones and tablets. Intel’s PC segment still represents nearly half of its total revenue, which has kept Intel from generating growth. Thanks to the contributions of Intel’s data-centric businesses, the company has returned to more robust growth rates. Intel’s earnings-per-share rose 28% in 2017, as revenue hit a record of $62.8 billion, and the company is off to a good start to 2018. First-quarter revenue rose 13%, while earnings growth jumped 32% from the same quarter a year ago. The main growth driver for Intel is its “data-centric” group of businesses, led by its data center segment. Data center revenue increased 24% last quarter. Other businesses in this area include non-volatile memory solutions, programmable solutions, and the Internet of Things (IoT). 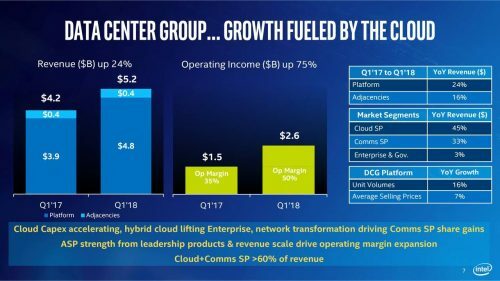 While its PC business grew revenue by 3% last quarter, the data-centric group increased revenue by 25% year-over-year, and now represents 49% of Intel’s total revenue. Intel’s reported earnings per share were lower in 2015 than they were in 2011, but the good news is its core PC segment is profitable and generates lots of cash flow to the company. Intel can use this cash flow to invest in new technologies, which are growing rapidly. Intel has a number of promising growth catalysts ahead of it, including autonomous driving, which is why it acquired Mobileye for $15 billion. The autonomous driving market is a massive opportunity for Intel—the company estimates the vehicle systems, data, and services market to reach up to $70 billion by 2030. The dawn of autonomous driving is rapidly approaching; Intel began operating autonomous vehicle test cars in Israel in the first quarter, with plans to expand the fleet to other geographies. Once Intel’s autonomous driving technology is up and running, the company should have little trouble forging partnerships with the major automakers and ride-sharing services. Separately, the Internet of Things is another major growth catalyst for Intel. IoT applications include connectivity for all sorts of devices, far outside the realm of smartphones, tablets, and PCs. Intel’s IoT business exceeded $3 billion in revenue last year and continued to grow revenue at a 17% clip in the 2018 first quarter. Intel’s rapid IoT growth is largely the result of the $16.7 billion acquisition of Altera in 2015. This major acquisition further expanded Intel’s IoT and data center businesses due to Altera’s leading field-programmable gate array (FPGA) technology. Altera now operates in Intel’s Programmable Solutions Group, which grew revenue by 17% in the first quarter. Along with first-quarter earnings, the company raised its outlook for the remainder of the year. Intel now expects 2018 revenue of $67.5 billion, up $2.5 billion from its prior guidance. This would represent 7.5% revenue growth for the full year. Earnings-per-share are expected to increase 11% in 2018. Intel is expected to report earnings-per-share of $3.85 in 2018. Based on this forecast, the stock has a current price-to-earnings ratio of 13.4. This is slightly above its 10-year average valuation of 13.0, and as a result we view the valuation as likely to come down to its historical average. Even so, the modest decline in the valuation multiple will only result in negative returns of just 0.6% per year. Earnings growth and dividends will more than offset a declining valuation and provide attractive returns for shareholders. Intel is expected to grow earnings at a 7% annual rate over the next five years. In addition, the company pays an annual dividend of $1.20, good for a 2.3% dividend yield. The combination of earnings growth and dividends is likely to provide annual returns of 9.3% over the next five years. Even when including a 0.6% negative return each year from a declining price-to-earnings ratio, Intel’s expected returns are 8.7% annually. This is still a strong rate of return for a mega-cap blue chip dividend stock. Plus, Intel has the ability to raise its dividend each year. Intel already raised its dividend by 10% in January, and the company has potential for future dividend increases. Based on 2018 expected earnings-per-share, the company is likely to have a dividend payout ratio of just 31% this year. This is a very low payout ratio that leaves plenty of room for future dividend increases. Intel was once associated with a slow-growth relic, chained to the PC and unable to keep up with the rapid changes in the technology industry. This reputation may have been deserved from 2011-2015, but this is a new era for Intel. The company has invested heavily in new technologies, such as autonomous driving, data centers, and IoT applications, and this investment is finally paying off. Through earnings growth and dividends, investors can expect satisfactory returns each year. Since Intel has a modest valuation and an above-average dividend yield, plus the ability to increase its dividend each year, the stock is an attractive option for value and income investors.